• Includes focused training for the USMS PFT, as well as extensive additional running, rucking, work capacity, bodyweight smokers, etc. • This plan is also one of the 185+ training plans includes with an Athlete’s Subscription to MTI. The plan includes a 1-week taper, and is designed to be completed directly prior to your selection course start week. This is a very intense, 6-day a week, often 2x/day training program with high levels of volume and stress. 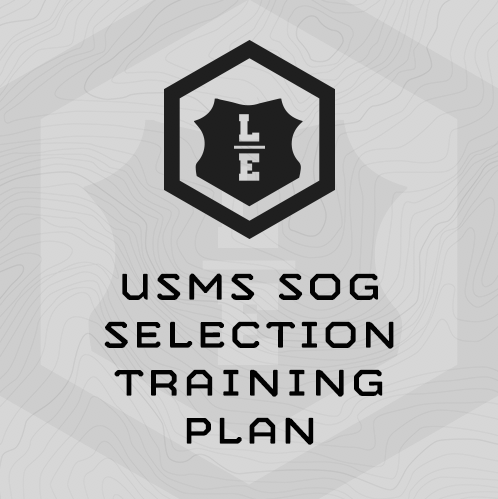 The intensity of this training plan reflects the volume and intensity of the USMS SOG selection course. Be safe and smart about your training as you work through the program and don’t be afraid to cut down sessions, or if necessary take an extra rest day if needed. This program follows a general format and gets progressively harder each week, until week 8, when the training tapers down into the start of selection. Don’t skip ahead!! The plan is designed to build upon itself. If you have to miss a training day, start up back where you left off. To successfully complete this program you’ll need to make training for selection a priority during your work day. GPS-enabled Stop Watch with repeating countdown timer (Garmin Forerunner 10 is recommended ) – a GPS Watch will make completing your running and ruck assessments and intervals much easier. What if I have less then 8 weeks before I start the Selection Course? Still start at the beginning of this training plan anyway. Don’t skip ahead. Building stamina and resilience is a key training goal of this plan, and physical and mental stamina is also key to completing the Selection course. If you can’t handle the training volume at first, it is better to cut training sessions short, rather than take unscheduled rest days. What if I can’t make the prescribed reps for the bodyweight exercises, or the prescribed interval times for the rucks, or runs? I can’t pass the swim and water tread… what should I do? Use our Swim Improvement Plan to increase water confidence on days which only have one training session. This is an easy test, but don’t let it be the reason you don’t make it. How do you count reps for Sandbag Getups, and Step ups? Step Ups – The prescribed rep count is total reps, so 600x step ups = 600 total, or 300x per leg. Where do I find descriptions for Unfamiliar Exercises? Can I see a sample training session from the plan? I’m not sure if I’m fit enough for this plan. What should I do? Start with the Sample Training from the tab above. If you’re smoked, Email rob@mtntactical.com for direction. GPS-enabled Stop Watch with repeating countdown timer (Garmin Forerunner 10 is recommended ) - a GPS Watch will make completing your running and ruck assessments and intervals much easier.